I was asked to bring Tasty Tuesday back! Link up a tasty recipe for others to try out! Combine all herbs and spices in a small bowl, blend. Spread half of herb mixture in cavity of chicken. Spread the remaining mixture over outside of chicken. Quarter or halve red potatoes, cut celery in large chunks and combine potatoes, carrots, celery, and onion chunks. 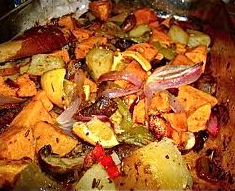 Arrange vegetables around chicken in a roasting pan. Pour wine into bottom of roaster. Roast covered at 350 degrees 1 1/2 hours basting occasionally and adding more wine if necessary to make"sauce". Uncover last 15-20 minutes to brown skin. This makes a wonderful sauce to spoon over the carved meat and veggies. Any leftover "sauce" makes a wonderful base for chicken soup. AND - don't forget...I have a giveaway up and running! Good luck! Oh my goodness, I am making this!! This looks soooo yummy! I have to try it!! this sounds so freakin' good!! i am definitely making this one night :) thanks for sharing! !